Tri-Mer’s C/E-1 Chrome Scrubber scrubs all chrome, including Cr6 and Cr3, at efficiencies of 99.5% or higher, regardless of input loading. Our chrome scrubber features a multi-layer polypropylene pad system which operates under negative pressure. The filter apparatus is washed continuously in a nearly closed loop configuration. When chrome levels approach set point (generally 3000 ppm) water is forwarded to chrome recovery, or returned to the plating bath. Tri-Mer C/E-1 chrome scrubber is a low energy system that generates less than 8" of internal static pressure, so energy consumption is extraordinarily low. Total water use is also low: average consumption is 15 gallons per hour for a 20,000 cfm unit. The C/E-1 chrome scrubber has no internal moving parts to wear or replace. Chrome can be recovered from both the gas stream and the filter. Our chrome scrubber is simple to install and operate and is available in single units with capacities to 50,000 cfm. 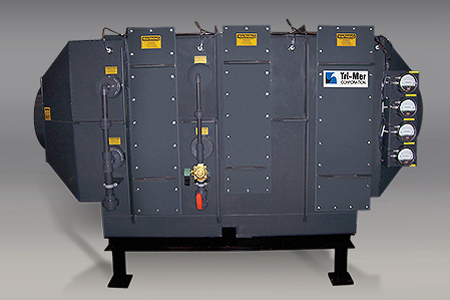 Installation can be accomplished by Tri-Mer or by plant personnel. Tri-Mer provides a standard skid-mounted package which includes duct connections, controls interfacing, fan, recirculation tank, pump and piping. The standard C/E-1 is constructed of Type 1 PVC, the material recommended for high chrome concentrations. The estimated minimum service life of the filter is five years under continuous use. The system averages ten years of continuous service before primary maintenance is required.